Hello everyone. I'm a Southie resident who's been lurking on here for some time. I've found this place to be a great resource for both what's getting built and the history of things in the area. With the introduction out of the way, I'd like to show you guys something I've had going on my head for a while. I'm a big racing fan, and one of my annual trips has become a visit to the Grand Prix of Baltimore over Labor Day weekend. It's a blast, and the new IndyCar races far better on street circuits than any car they've had in the last decade. And it gets me thinking: What if Boston were to hold an IndyCar race? The track could not be within a heavily settled area, for obvious noise and disruption purposes. The track should mainly feature roads that are 3 lanes (2 travel + 1 parking) minimum wide, or streets that could be converted to that with minimal infrastructure changes. The track needs to be near a big enough building or open area for paddock space. The track needs to have enough areas available for grandstands. The track needs a minimum 1000 ft. stretch for a pit lane. And finally, with all that considered, the track should be designed to have multiple passing zones (i.e. long straights followed by sharp corners, where drivers can outbrake each other). I settled on the Seaport for these reasons. I know open space is shrinking there, but there's still enough to fully support the required items, as well as being fairly walkable for attendees. The track itself is a 9 turn, counter-clockwise circuit, with the start/finish line in front of the BCEC on Summer Street. Potential passing zones would be turn 1 (Summer and D), turn 5 (Seaport and B), and turn 8 (Congress and Dorchester). Paddock space is provided in the BCEC for the IndyCar Series, two Road to Indy ladder series, and the Pirelli World Challenge sports car series. There is also a kids zone in the BCEC, and midway/fan zones on the streets around the hotels by the World Trade Center. I say theoretical, by the way, because there are a multitude of reasons why a Grand Prix of Boston would never take place, including the Baltimore race itself, a perfectly good NHMS that should be on the IndyCar schedule, and the public expense that this type of thing would take (and I wouldn't agree that using public dollars for a race like this would be a good idea, either). But, it's fun to dream, right? I have some other ideas that I might get down in Google Maps at some point as well, but this seems like the most logical and somewhat realistic. Thoughts? Thats not exactly a productive sentiment. IIRC, some of our other members have laid out/are in favor of a Grand Prix in Boston. The discussion comes up every so often in the Seaport thread. If they are going to do this they should go for the "formula-E" electric racing. If we consider ourselves a hi-tech city and want to race in the Innovation District we should not be pushing dead dinosaur technology (yeah, I know they run on ethanol). By the way, I believe Celtics owner Wyc Grousbeck also owns an electric racing team. I definitely vote for this option! 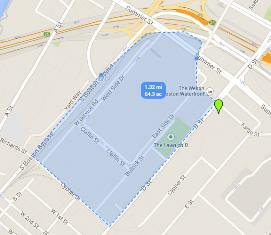 Going Formula E would definitely help A123, being right on their doorstep in Waltham. I'll be blunt here: No one cares about "formula-E" at this point, and it won't be worth the cost or inconvenience to hold it, given that it's draw is approximately zero. If you're going to hold a street race in the city, you want Formula One or IRL. Nothing else is worth the effort, and quite frankly, no one cares what the cars for a one day event run on outside of noise considerations. I was thinking the same. Maybe electrics would be great to have as AN event, playing up our local green tech sector, but not as the MAIN event. That I'd agree with, or something to show an example of where the future is going. I'm sure there's probably quite a bit of "show" things that come along with a Formula One event. Mercedes and Renault both produce various "eco-friendly"/high-tech vehicles, I'm sure the city could request they bring a couple over for display. The technology in F1 cars is fascinating as it is, and they are to some extent "hybrids", as they have regenerative braking. That I'd agree with, or something to show an example of where the future is going. Sigh.... another person who knows where the future is going. I just turned 60, and I'm still waiting for my jet-pack. If you know the future. there is no shortage of people who will give you $100 million to tell them what it is. While I'm typing these words, the price of a gallon of gas just fell to a dollar buck eighty, or something like it. All who predicted that, please raise your hands. There was some talk on this board about using D Street. If the BCEC expands as planned, you wouldn't have much push back from abutters, since there are just 2 residential projects - Flats on D (rentals) and 407 D Street (condos). I don't think using Seaport Blvd near Liberty Wharf would fly. It feels very congested there. I would propose using Seaport Blvd up closer to Fort Point Channel b/c it's wide there (get rid of the median). I also propose using the Silver Line tunnel for at least some of it. So, there has been progress in plans for a Grand Prix race to be held in Boston in 2016. It seems to me there would be huge liability - fences or no fences - but I guess that's what insurance is for, right? Even though I'd be affected by the inconvenience of having roads (potentially) blocked off for 4 weeks, I don't mind the idea. Kind of funny, considering my vehement opposition to the Olympics. Of course, that's a much bigger deal with much larger implications for everyone, not just me. Being held during Labor Day weekend, set up of the street course would take approximately 3 weeks and tear down another week. The preliminary course runs under the BCEC and the Westin Hotel on Fargo Street taking a right on to D Street (map below). Protection Fences/Barricades reaching 12+ feet high would be erected along the course route and would impede access to the lower garage of Seaport Lofts and both garages at the Flats on D. Noise levels could reach as high as 140+ decibels. In addition to this, street parking would impacted as well as our overall access to surrounding roads. 1. Haven't they seen Iron Man 2? Grand Prix races attract super villains. 2. I know very little about Grand Prix (see comment 1), but that course looks pretty mundane compared to something like Monaco. 3. To be fair, John's mouse-drawn course map looks anything but mundane. Who "owns" the Grand Prix circuit? What does a city have to promise in return for hosting a race? Someone on the Southie Community Board posted a link to this story about Baltimore's experience with the race. I haven't done any research on it. The embarrassing and unfortunate financial failure of the Baltimore Grand Prix was caused by a pervasive culture of secrecy and privilege within City Hall and at Baltimore Racing Development. Had more facts been available to the press and the public, it would have been abundantly clear that the race was in jeopardy even in its earliest planning phases. The failure to secure a lead sponsor was, in retrospect, a body-blow that should have led to the race's cancellation or postponement. Instead, a small group of insiders within BRD and City Hall reassured the race's political sponsors that everything was in hand. And within city government, I was told, people with dissenting opinions about the race were eventually no longer invited to meetings. Propagandists and politicians use an over-reliance on secrecy to shape popular opinion and suppress dissent. But the success or failure of the Grand Prix was not a matter of opinion; it was a matter of financial facts. And the facts show that as a business proposition, it was a dismal failure — ultimately indebted for more than $12 million and having snubbed multiple creditors, including the city, state, and multiple small businesses. The Baltimore Sun shed light on many aspects of the race. However, despite their efforts, reporters were only able to puncture the "veil of secrecy" around the race periodically — and often after the fact or within a limited scope. Baltimore City should have made all of its contracts and correspondence with BRD open and a matter of public record. It should have required BRD to enter reviewed financial statements into the public record every 60 days. Had everything been more open, the insiders who thought they could turn it around would have had a clearer picture, and also would have had to answer to informed public inquiry. Instead, intelligent public debate was starved by a lack of facts. Baltimore Sun opinion writers supported the race based on assumptions promoted by BRD and the city that turned out to be speculative or false. The ensuing public debate was accordingly limited to ad-hominem attacks that did not further any deeper understanding of the pertinent questions. I sued Baltimore City last summer to stop what I perceived to be an illegal removal of trees. But this was prompted by secrecy and incompetence. We asked for a copy of the city's tree plan, from either the city or BRD, and got nothing. We asked for assurance that no more trees would be cut before the plan was released, and still more trees were cut. As a result of our suit, the city did release its tree plan, and the count of trees actually cut dropped from 139 to about 40. And now, taxpayers will be paying for the replanting — which BRD was supposed to cover. We are moving into a new era where secrecy in city government is no longer acceptable. The default position for all city information should be "open," and that includes the dealings of Baltimore Development Corporation and economic development partners like BRD. In the age of "Occupy" and the "Arab Spring," we need to liberate reporters up from the clerical task of "freeing information" so they can do the important inquiry and analysis for which they were trained. Only overwhelming public pressure can free this information. If and when Baltimore City enters into another agreement to try to revive the Grand Prix, we must demand 100 percent openness. Because if the deal can't withstand thorough public scrutiny, it almost certainly is a bad deal for Baltimore. David Troy, a Bolton Hill resident, is CEO of 410 Labs, a Baltimore-based technology development firm. His email is dave@410labs.com. With Bernie Ecclestein being the current owner of F1, tracks have to make huge payments to F1 Management to get a race, in the 10s million dollar range. However, the annual running costs of a street race are greater than those of one on a permanent circuit: temporary grandstands need to be built and the roads need to be upgraded to F1's high safety standards. The biggest single expense for the operators is staffing (c£10m), followed by rental of grandstands (c£8m) and construction of safety barriers and fencing (c£5m). In total, the annual operating cost of an F1 street race is in the region of £36m. Then comes the hosting fee, which is paid to the F1 rights holder. The average hosting fee came to £17m in 2011 but the sting in the tail of the contracts is that the price accelerates by as much as 10 per cent every year. Most new F1 race contracts are for ten years, so by the end of the agreement the annual fee comes to around £40m thanks to the escalator clause in the contract.